If the area of a cross section of a solid is known and can be expressed in terms of x, then the volume of a typical slice, ΔV, can be determined. The volume of the solid is obtained, as usual, by letting the number of slices increase indefinitely. In Figure N7–9, the slices are taken perpendicular to the x-axis so that ΔV = A(x) Δx, where A(x) is the area of a cross section and Δx is the thickness of the slice. A solid has as its base the circle x2 + y2 = 9, and all cross sections parallel to the y-axis are squares. Find the volume of the solid. ΔV = (2y)2 Δx = 4y2 Δx = 4(9 − x2) Δx. 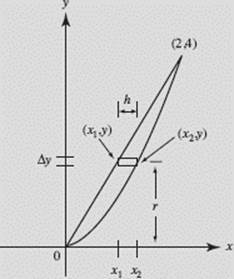 Questions 25, 26, and 27 in the Practice Exercises illustrate solids with known cross sections. When the cross section of a solid is a circle, a typical slice is a disk. When the cross section is the region between two circles, a typical slice is a washer—a disk with a hole in it. 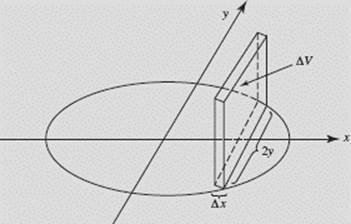 Both of these solids, which are special cases of solids with known cross sections, can be generated by revolving a plane area about a fixed line. 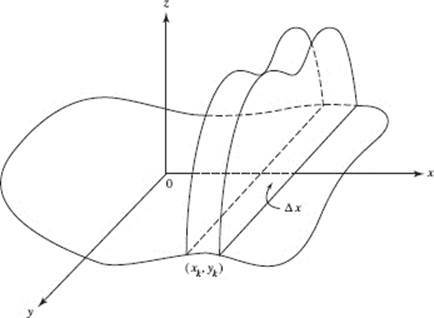 The region bounded by a curve and the x-axis is revolved around the x-axis, forming the solid of revolution seen in Figure N7–11. We think of the “rectangular” strip” of the region at the left as generating the solid disk, ΔV (an element of the volume), shown at the right. 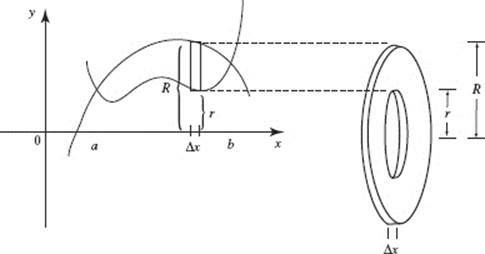 Find the volume of a sphere of radius r.
SOLUTION: If the region bounded by a semicircle (with center O and radius r) and its diameter is revolved about the x-axis, the solid of revolution obtained is a sphere of radius r, as seen in Figure N7–12. Find the volume of the solid generated when the region bounded by y = x2, x = 2, and y = 0 is rotated about the line x = 2 as shown in Figure N7–13. See Questions 18, 49, 51, 52, and 53 in the Practice Exercises for examples of finding volumes by disks. A washer is a disk with a hole in it. The volume may be regarded as the difference in the volumes of two concentric disks. 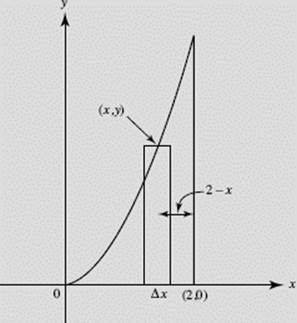 As an example, consider the volume of the solid of revolution formed when the region bounded by the two curves seen in Figure N7–14 is revolved around the x-axis. We think of the rectangular strip of the region at the left as generating the washer, ΔV (an element of the volume), shown at the right. 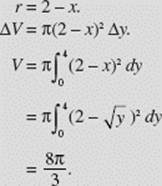 Find the volume obtained when the region bounded by y = x2 and y = 2x is revolved about the x-axis. SOLUTION: The curves intersect at the origin and at (2, 4), as shown in Figure N7–15. 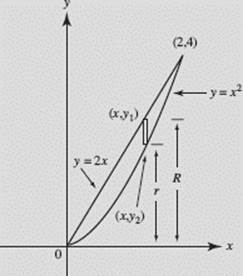 Note that we distinguish between the two functions by letting (x, y1) be a point on the line and (x, y2) be a point on the parabola. Find the volume of the solid generated when the region bounded by y = x2, x = 2, and y = 0 is rotated about the y-axis, as shown in Figure N7–16. See Questions 19, 21, 48, 50, and 54 in the Practice Exercises for examples in which washers are regarded as the differences of two disks. Occasionally when more than one method is satisfactory we try to use the most efficient. In the answers to each question in the Practice Exercises, a sketch is shown and the type and volume of a typical element are given. The required volume is then found by letting the number of elements become infinite and applying the Fundamental Theorem. A cylindrical shell may be regarded as the outer skin of a cylinder. Its volume is the volume of the rectangular solid formed when this skin is peeled from the cylinder and flattened out. As an example, consider the volume of the solid of revolution formed when the region bounded by the two curves seen in Figure N7–17 is revolved around the y-axis. We think of the rectangular strip of the region at the left as generating the shell, ΔV (an element of the volume), shown at the right. ‡Examples 10–12 involve finding volumes by the method of shells. Although shells are not included in the Topic Outline, we include this method here because it is often the most efficient (and elegant) way to find a volume. No question requiring shells will appear on the AP exam. 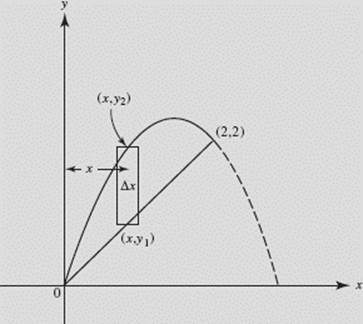 Find the volume of the solid generated when the region bounded by y = x2, x = 2, and y = 0 is rotated about the line x = 2. See Figure N7–18. The region bounded by y = 3x − x2 and y = x is rotated about the y-axis. 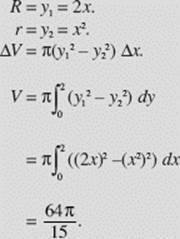 Find the volume of the solid obtained. See Figure N7–19. 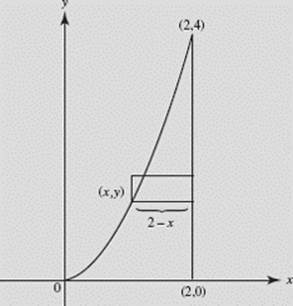 SOLUTION: The curves intersect at the origin and at (2,4), as shown in Figure N7–20. 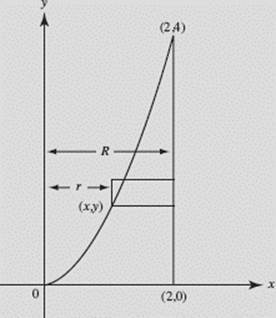 Note that we distinguish between the two functions by letting (x1, y) be a point on the line and (x2, y) be a point on the parabola. 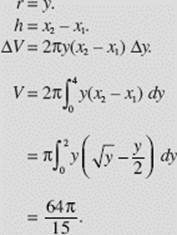 NOTE: In Examples 32 and 33 we consider finding the volumes of solids using shells that lead to improper integrals.